On behalf of the EVC organizers and in my capacity as president of the IVD it is my pleasure to invite the Greek community of vascular surgeons and endovascular specialists to the 22nd European Vascular Course (EVC) which will be organized on March 4-6, 2018 in Maastricht, the Netherlands, the preliminary program is now available here. On Saturday, March 3, the UEMS Section and Board of Vascular Surgery will organize the European Examinations for vascular surgery at EVC. The main goal of EVC is to provide training and education in vascular and endovascular procedures and therefore we focus on young vascular surgeons and interventional vascular specialists. The program includes a wide spectrum of subjects in vascular and endovascular surgery, venous pathology and vascular access. In addition to the 110 invited lectures with edited video’s on techniques, we will have more than 50 workshops, master classes and hands-on training sessions with fantastic models to learn latest technologies. All participants will receive the well-known textbooks, comprising detailed didactic chapters on the subjects presented in the scientific program. 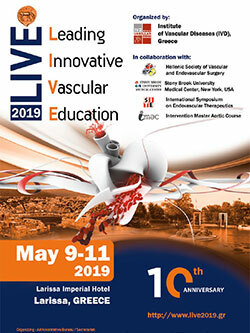 In order to support participation of the Greek community of vascular surgeons and endovascular specialists 10 free registration will be offered. However, due to the significantly increased attendance 150€ per delegate will be required to cover the costs of catering and the entire infrastructure during the three days. To claim free registration you are kindly requested to send you e-mail at info@ivd.gr the latest by December 18th 2017. Registrations will be handled on a first-come first-served bases.